2 Commercial Real Estate & Properties in Wedgefield are listed in 1 categories. We have 2 Industrial Warehouses Lease . ***** $2500 + Gst Per Calendar Month******* $2,500.00 + gst per calen.. Combine the business site with an approved residential house located on the premises. 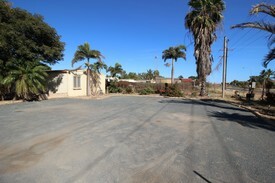 Lot size is approx 1375m2 and the location is on one of the busiest streets in Wedgefield. There is a brick 2 bedroom residence with a generous lounge area. A well appointed kitchen and bathroom complete the interior. The house has a garden with reticulation and a BBQ area for relaxation. The bedrooms and lounge/kitchen area all have split system air conditioners installed. A high truss shed of approx 120m2 is located towards the back boundary of the property and hard stand area offers a great amount of space. The property has everything that you need to operate exposure, hardstand lay down area and a residence. Don't wait, Act now! Call Peter Dunning today on 0419 928 927.